The streets are filled with historical buildings many of which have a faded colonial charm not seen elsewhere in Asia. You’ll start at the post office – a lovely historic building, passing by Strand Hotel, Mahabandoola Garden and Independence Monument along the way. 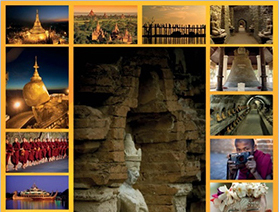 Then visit famous Chauk Htat Kyi, home to a 70-meter long reclining Buddha. The feet of the statue carved with traditional symbols and often many locals gathering to pay homage and pray. Photo stop at the Karaweik Hall royal floating barge. Nothing will prepare you for Shwedagon Pagoda, with its glittering gold stupa. At the pagoda observe local pilgrims and monks offering their devotions and enjoy the amazing sunset view at Shwedagon pagoda. Visiting Inle Lake is not just about being on the water but also about discovering the Shan and Intha villages on the banks of the river. Pass the endless floating gardens, houses, monasteries built on stilts on the lake. Stop at Nga Phe Kyaung Monastery then proceed to Nampan village and see local cheroot factory (where the Burmese cigars are made) and canoe carving.